Olivia and I are fiiiiinnallly feeling better and I'm really excited to celebrate Valentine's Day this week. We have a really fun day planned and I have been wanting to come up with a new breakfast treat to start off our celebration. I'm so excited to share this adorable and really yummy recipe. It's a fun alternative to waffles or pancakes and just as big (if not more!) of a hit. They taste like a combination of french toast and a churro. They're sooo good. I love them on their own, (which makes them easy to eat with your hands, too!) but you could also top with syrup or nutella (omg!) I made them hearts for Valentine's Day but of course you could make them other shapes too for a different occasion. They are a sweet little treat that would be perfect for a special breakfast in bed or fun and tasty breakfast before your kiddos head to school. Starting the morning with something thoughtful and special is the best way to start any day, but especially when it's a holiday. 1. Using your cookie cutter, make your heart shapes out of the bread. I used a larger heart and then made some smaller hearts by hand using a knife. Slightly stale bread will hold the shape a little better. If you have a fresh loaf, you can pop the bread in the oven for a few minutes just to get it to stiffen up a bit. If you want to save time, you could always do this heart shape step the night before. 2. Combine eggs, milk, and vanilla into a bowl and mix thoroughly. 3. In a separate bowl, combine the cinnamon and sugar. 4. In a pan over medium heat, melt the butter. 5. Dip each heart into the egg mixture. Be sure not to over do it or they will get too soggy. 6. Place heart bread in the frying pan. Cook approximately 2 minutes per side, or until golden brown. 7. 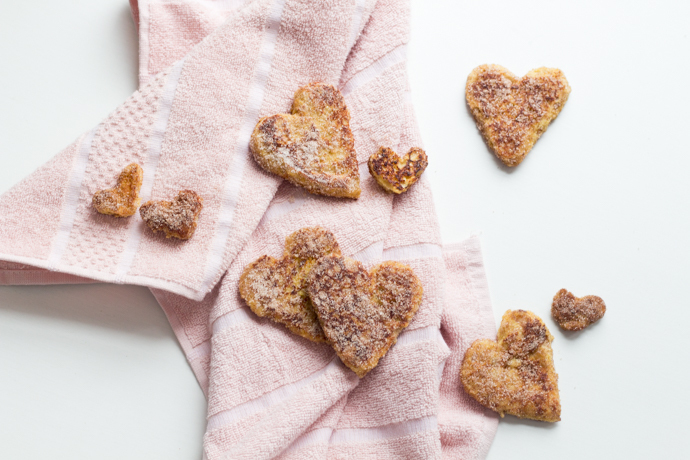 Transfer the cooked hearts to the cinnamon sugar mixture and coat them thoroughly.